Exercise is incredibly beneficial to the body, as health experts assert that it can help prevent various illnesses and help the body perform at optimal level. 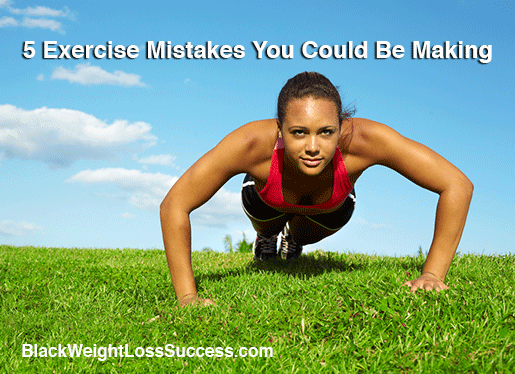 * You’ll also be more likely to have more energy and just feel better when you exercise regularly. Even moderate exercise, like walking, can make a difference in your mobility and health in the long run. However, like anything else, fitness should be approached properly. As you move forward with a commitment to exercise regularly, keep the following tips in mind regarding bad fitness habits. If you find yourself doing any of these things, it is time to make a change and start approaching your fitness routine differently. Your body spends glucose (sugar) while you work out, and you need to have some stored in the body before you start exercising. Glycogen can be found in the liver and muscles and you’ll also find sugar in the blood stream after meals. The lack of glucose in your system can cause your body under perform while working out. You may also feel dizzy and weak afterwards. For optimal results, have a small, healthy snack or meal an 30 min to an hour before working out. Here are some ideas on what to eat. It is well known that stretching before exercise is important, yet a lot of people still avoid it. This is a huge mistake, as the absence of proper stretch routines can have negative consequences, such as muscle strain, limited range of motion or injury. It is also important to stretch the correct way. If you have any questions regarding stretching, do some searching on YouTube for fitness experts who will show you the correct way to stretch. Or, if you attend a fitness center, ask a trained fitness instructor to teach you. Before you begin your exercise it is best to do about ten to fifteen minutes of stretching and warming up the body. Cardio is useful and does burn fat effectively, but you should not focus solely on this type of exercise. For optimal results, combine cardio with some strength training. Many women ignore weight training due to a belief that they will get “too bulky” or not look feminine with muscle. That’s a mistake. You will not just gain mass quickly from lifting light to moderate weights. Body builders and fitness competitors really put in work in the gym and work on perfect their eating plans to build lots of muscle. Don’t be afraid to use moderate to heavy weights because muscle burns fat and helps you keep your curves. Mix up your routine with different types of exercises. Do some pushups, some burpees, some lunges and some cardio. Then, finish with weight training. Ask a gym personnel, to show you the ropes and how to use weight machines. Go online and look at videos to see proper form and beginner routines. 4. Using the same workout routine all the time. People tend to choose a certain exercise routine and stick to it every time they visit the gym. This is not the way to go if you want your body to continue progressing as you work out. Your body gets use to the process you put it through, and if you repeat the same exercises over and over again, they will eventually reach the peak of influence. Your body won’t be challenged to grow and get stronger. You may also be unbalanced in terms of some body parts getting a lot of exercise and others getting very little. That’s why it is important to change up the types of exercise you put yourself through every couple of weeks or so. For example, find 4-5 routines you like (cardio, weight training, HIIT, Zumba, workout DVDs, etc.) and rotate them through the course of the month. When it comes to fitness, try not to push yourself TOO hard. It’s great to have passion and motivation, but if you push too hard, too fast, you could end up burned out or injured. Many people want results fast and overdo their efforts as a consequence of that desire. The flip side of that is the high probability of injuries and lack of motivation when you don’t see quick results. If you’ve worked hard to establish an exercise routine that benefits your body, don’t mess up all your hard work by pulling a muscle that will make it impossible for you to continue. Know your limits and give your body a chance to rest and recover. It’s wonderful that you’re interested in fitness and committed to working out, but avoid doing the things that could bring you harm. Keep these tips in mind as you move forward with your fitness regimen, and you will have a healthy, fit body before you know it. Not only will your body benefit, but you will have more energy, a more positive outlook on life, and generally feel happier.